If you want to get better at fly fishing, one thing is for sure: you need the best fly fishing net to do that. As an angler, you’re probably on the lookout for ways to enhance your game. 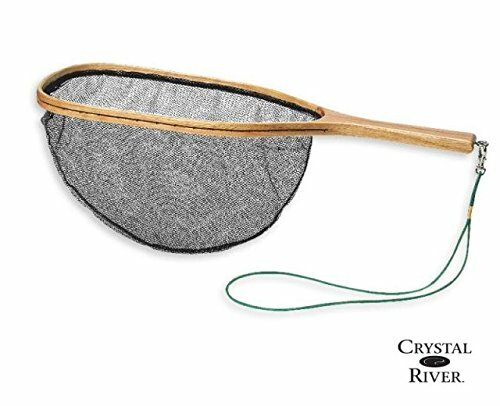 ​Today, we’ll share with you a bunch of helpful tips on choosing a fly fishing net, as well as some suggestions of products! 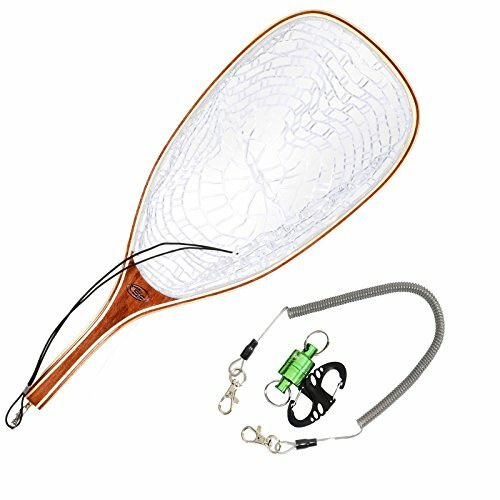 What to Look for in the Best Fly Fishing Net? Let’s say you fish around 30+ days per year; in this case, your net should be up for the task. In other words, it should resist bouncing around in the back of your truck, or getting stuck between rocks – you know what we’re talking about. Also, landing on big fish could determine flimsy nets to break in an instant. The material of the fishing net will largely influence the durability factor. The most commonly met materials are rubber and nylon mesh. Rubber nets have become more and more popular since they don’t hurt the fish as nylon mesh does. You have probably struggled to get fish out of a tangled nylon net, and it wasn’t the happiest situation, was it? What is more, rubber is surprisingly durable and is difficult to spot inside the water, which is a great advantage. The downside of choosing nylon mesh is that you risk splitting the fish’s tail fins. There are also nets made of carbon fiber and fiberglass. Evidently, these items rank high in terms of durability, while being surprisingly lightweight. Also, because of this, they are more on the pricier side. Do you like fishing from a boat? 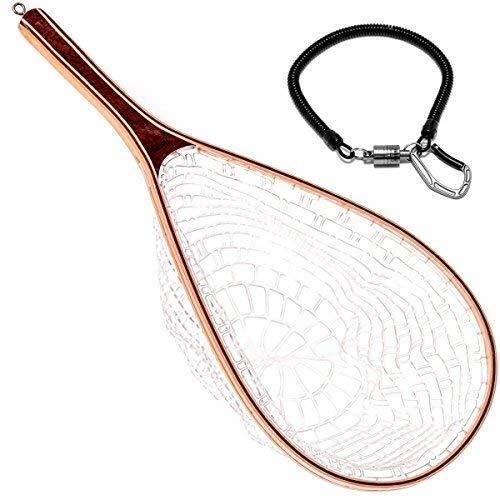 In this case, you’ll want to look for the best fly fishing net equipped with a long handle. This will be convenient and practical. Still, the downside to long-handled nets is that they can be a drag to carry around. However, if you enjoy fly fishing on the shore of the river, perhaps this isn’t a necessity for you. Nevertheless, when it comes to boat fly fishing, a long handle is the way to go. Contrary to popular belief, practicing catch and release doesn’t guarantee the survival of the fish. In fact, the fish can still be seriously injured. Apart from that, even if you don’t injure the fish, it can still die from stress if not handled accordingly. That being said, mastering the technique could significantly increase the survival of fish species. On that note, we advise you to watch this video that contains a range of helpful tips and techniques. This is a practical and great acquisition for numerous reasons. For starters, the use of rubberized mesh means that you won’t have to worry that the net will tangle. That used to be a common concern with most fishing nets. This net was tested in rivers, lakes, and streams. What was the conclusion? It worked great in each scenario, which is a great advantage if you like fishing in different environments. The frame is made of laminated hardwood and bamboo. In other words, this item won’t catch the fish's attention. Another excellent feature is the magnetic release. You may have your doubts regarding the sturdiness of this type of release. However, they will soon be eliminated after you test the net. As a downside, you should know that the holes in the bottom of the net are a bit bigger than the ones on the sides. Therefore, trout and salmon could easily get stuck when trying to get out. As a result, this could kill the fish. 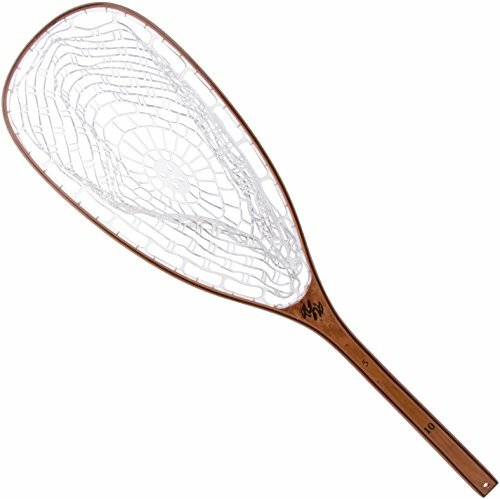 This is another item that qualifies as the best fly fishing net. This one could easily accommodate big trout and bass without any problems whatsoever. Similar to the first product, this net is also made of clear rubber mesh. It almost disappears once it gets in the water. This is a significant advantage, as it won’t scare fish away. Moving on to ease of use, you should know that the included carabiner and magnetic release are two nice additions. In fact, you can even hook the net to your backpack, which makes it very easy to carry around. Moreover, being constructed of hardwood material, this item can withstand mold and mildew, and you won’t have to buy another one every couple of months. The rubber appears to be sturdy, as well. However, we could voice one complaint about the item. The magnet in the magnetic release should have a better attachment. After a couple of uses, it becomes a bit loose, so you must be careful with that. On the whole, the soft, flexible mesh prevents tangling, while facilitating a quick release. This fishing net features fine mesh netting. This aims at safeguarding the fish from getting caught in the holes and getting injured. Also, the frame of the item is made of long-lasting wood, which ensures its durability. What is more, being quite shallow, the amount of movement will be reduced. This will minimize the likelihood of injuring the fish. That makes this item a good option for an easy and secure release. Still, you have to move fast with it. Moreover, the fishing net features an elastic lanyard. That helps you have a better grip of the item. What about the potential disadvantages? We would have to say that this item is a bit too small. Especially when it comes to catching large trout. It is too narrow and shallow for this purpose. So, it’s only good for small fish. Also, you have to be careful about tangling. Since it is so lightweight, if the fish start spinning and flipping, the hook will tangle and eventually get stuck. So, you will have to waste a bit of time to detangle it. This fly fishing net is one of the best on the market, and you will see why. To start with, the length of the handle is just right. The burl wood on the handle is also a nice feature. This item is made of rubber. Distinct from mesh or nylon nets, rubber is gentler on the trout, minimizing the likelihood of unwanted incidents. Another good thing is that your prey is less likely to notice the presence of the net since it basically disappears once it gets inside the water. This is one of its greatest advantages. Also, in case you accidentally drop this in the water, it will float. So, you won’t have to dive into the river or lake to get your net back. That’s quite inconvenient, especially when it’s cold outside. As for the downsides worth mentioning, you should note that the narrow width makes it challenging to catch fish over 22 inches. Another potential disadvantage is that the material of the net doesn’t seem that durable. Still, overall, this is a decent budget choice for the best fly fishing net. The best fly fishing net needs to be able to handle the wears and tears of wading, and a size that will work with the kind of fish you plan on catching. If you plan on catch and release, make sure to go with a rubber net. It dramatically increase the fish's chance of survival. Which do you think is the best net for fly fishing? Let us know in the comments below!